Fountain pens, frankly, are intimidating. For someone like me who’s never used one, they seem a bit finicky and archaic. Learning to become a fountain pen user seems almost like learning to drive stick or learning how to ferment homemade vinegar. There are fervent advocates for all these practices, but to an outsider, they seem like they might be more trouble than they’re worth. So why bother? Type “why use a fountain pen?” into Google, and you’ll be met with a host of reasons listed on various websites and blogs. Unfortunately, most of these reasons just don’t speak to me. For example, a blog at oPENions describes how fountain pens can be great for left-handed writers, but I’m not a lefty. A blog at Writer’s Bloc does a great job of explaining how fountain pens are good for people with weak wrists, carpel tunnel, or hand-cramping issues, but none of these are problems for me. A post at Goulet Pens even mentions that fountain pens can save you money in the long run, though if this were a major concern, it would be cheaper for me just to swipe ballpoints from bank lobbies. For me, there’s only one reason that makes sense. All of those blogs touch on it in one way or another, but I think blogger Ed Jelly puts it best: “Maybe it’s the inner pen geek speaking, but I find it fascinating that there are several parts and either a steel or gold piece of pointed metal that deliver ink to page. Capillary action draws ink from the internal reservoir through a feed to regulate the flow, all the way to the tip of the pen… Different pens have different filling systems and clear pens (called ‘demonstrators’) let you see all the inner workings. Tell me that isn’t more interesting than your standard ballpoint? !” In other words, fountain pens are just kind of neat. So, in order to learn about fountain pens and decided for myself whether they’re worth the trouble, I’m starting this new series of posts to explore them. Because fountain pens come in a wide range of varieties – different types of nibs, ink refill systems, barrel materials, etc – I intend to look at a broad spectrum. 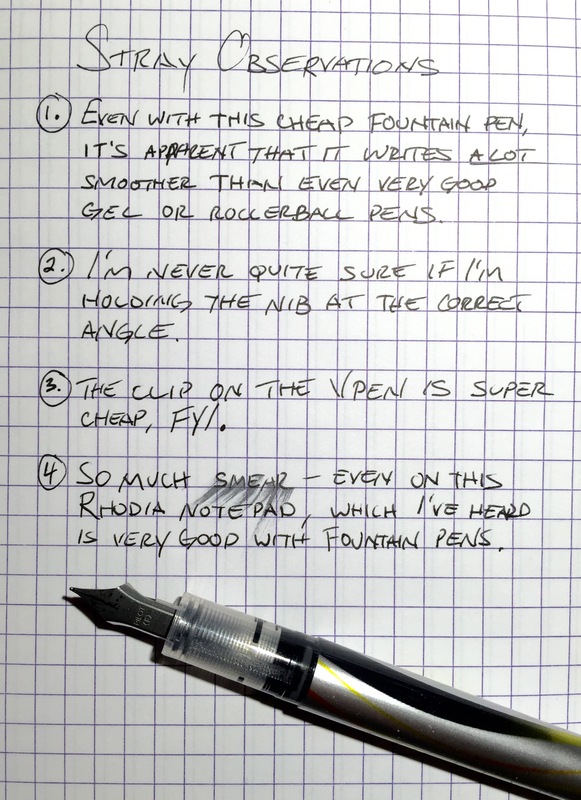 And I’m beginning with the simplest fountain pen on the market, the Pilot VPen. At $2.60, the Vpen is also probably the cheapest fountain pen you’ll find on the market, and it definitely looks the part. Its body is light and made of plastic, It’s non-refillable, and entirely disposable. Still, it was fun to use, and surprisingly smooth. Of course, nobody would consider this a great pen. The ink flow skips in and out occasionally, and it bleeds through paper fairly easily. A decent gel pen beats it any day, but it nevertheless has me looking forward to trying another fountain pen. And perhaps next time I’ll spend few more dollars. Interested in reading more? Subscribe to the blog here. I have not used the V-Pen, but the Pilot Varsity is a very nice pen on the cheap end. I don’t know why they’d be different, but they must be, as my experience with the Varsity has been very consistent and wet ink flow. Like the V-Pen, it is also intended to be disposable, but you can easily pull the nib/feed out and fill it with more ink! I’ve had some for years (literally over 15 years) and they never dry out or stop working. Of course if you want to move up in pricing, there are plenty to try that are under $20. Don’t let the pen snobs tell you there’s nothing good at that level. I think the VPen might just be a rebranding of the Varsity. And yeah, I’ve already ordered a couple fountain pens in the 20 dollar range, and I’m excited to try them.